SolarWinds, Inc. (NYSE: SWI), a leading provider of powerful and affordable IT management software to more than 97,000 customers worldwide, today announced that it is set to address the unmet and growing needs of systems and virtualization administrators. The company is entering the application performance and virtualization management markets through the launch of SolarWinds Application Performance Monitor (APM) and the acquisition of Hyper9, a privately-held virtualization management software provider based in Austin, TX. SolarWinds is entering the application performance and virtualization management markets through the launch of SolarWinds Application Performance Monitor (APM) and the acquisition of Hyper9 and its next-generation virtualization management products. The company’s experience in making powerful, easy to use network and storage management products accessible to users in a wide range of businesses gives it an advantage in addressing the unmet needs of IT organizations as they work to ensure the performance and availability of business-critical applications and virtual infrastructure. The SolarWinds product family now covers the fundamental aspects of business-critical applications and IT infrastructure – network, storage and systems –with integrated visibility into both virtual and physical environments. The company believes that a strong entry into these markets represents an opportunity for continued growth and brand expansion in the IT management space. 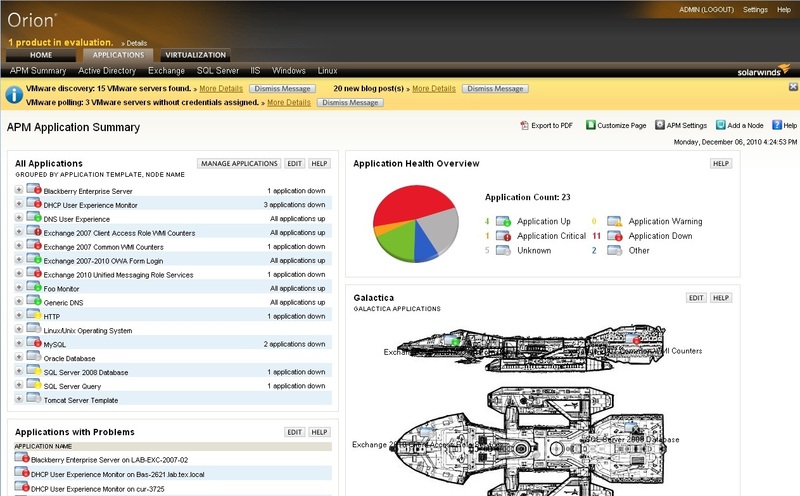 SolarWinds is launching its application performance management product. SolarWinds Application Performance Monitor is a comprehensive application and server management product that provides visibility into the performance of critical IT services, the underlying application components, the operating system, and the Windows, Unix and Linux server resources on which they run. SolarWinds Application Performance Monitor pricing starts at $2,495 (USD), with the first year of maintenance included. For more information, visit the SolarWinds website, download a free 30-day evaluation, or call 866.530.8100. Hyper9’s virtualization management offering adds optimization, capacity planning, configuration and chargeback reporting for virtualized server environments to the SolarWinds portfolio. SolarWinds expects to offer the virtualization management products at pricing starting at $3000 (USD), including the first year of maintenance – a fraction of the cost of current virtualization management providers. This price point will make the SolarWinds offering one of the most comprehensive and affordable virtualization management offerings in the market. For more information on Hyper9 and the company’s portfolio of virtualization management solutions, visit www.hyper9.com. “The launch of the latest SolarWinds APM and the acquisition of Hyper9 give us an extremely compelling value proposition for systems and virtual admins, specifically, as well as for integrated IT organizations. We believe that IT organizations are tired of ‘making do’ with solutions that are too complex, too expensive and aren’t responsive enough to address rapid changes in technology or the dynamic needs created by today’s IT reality,” said Suku Krishnaraj, Senior Vice President of Product Strategy, SolarWinds. Posted in General, IT News, Tech Information and Analysis and tagged news, solar. Bookmark the permalink.